Although I've been a true lover and researcher of history for most of my life, the world of time-travel first opened up to me back in the mid-1990s when I took part in the Holly Dickens Festival where I became a Dickensian character to help bring to life the era of Charles Dickens 1843 "A Christmas Carol." Though not reenacting (it was more street theater), it was, for me, the catalyst for all future-past excursions to come - it gave me the want to dress in period clothing beyond Christmas and continue to bring history to life throughout the year. 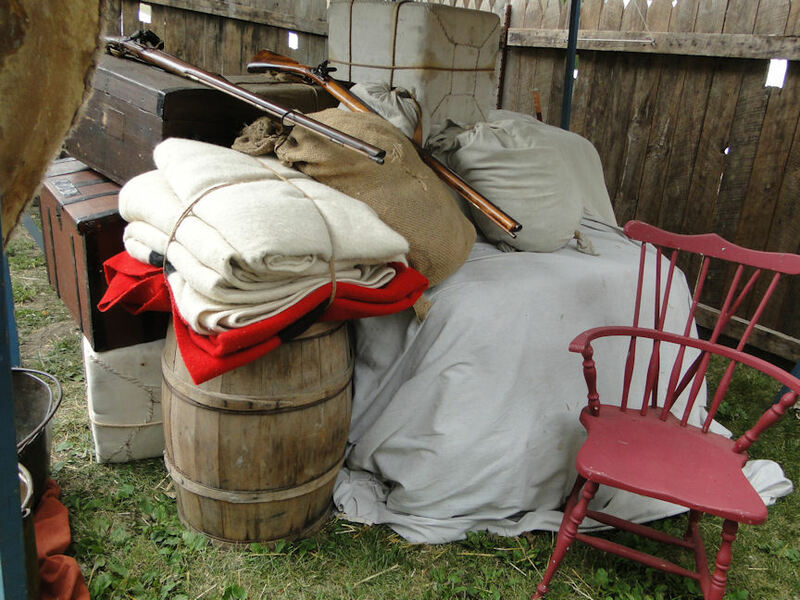 So I began to do presentations for my local historical society, then met and fell in with the 21st Michigan Civil War group, which I am still very much a part of, and, more recently, have added the Revolutionary War period of American history to my living history resume'. 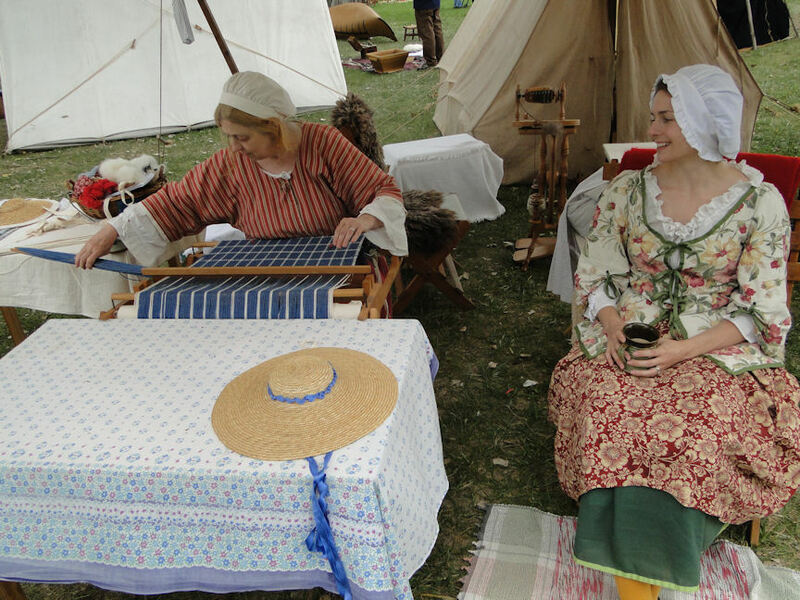 Bringing the past to life indeed! As a "Patriot...a Revolutionary," I dress in more of the English fashion of the day and favor the idea of possibly portraying Paul Revere, which I have been doing for school-age kids over the past year or so. Now I'm finding that there are many adults - too many, unfortunately - who know so little about this great American Patriot and of the many things he did for his country (besides his most famous ride), which makes me want to portray the man even more. But Michigan, my home state, has a very different history attached to it than, say, Massachusetts; we have a group of fur traders called The Ste. 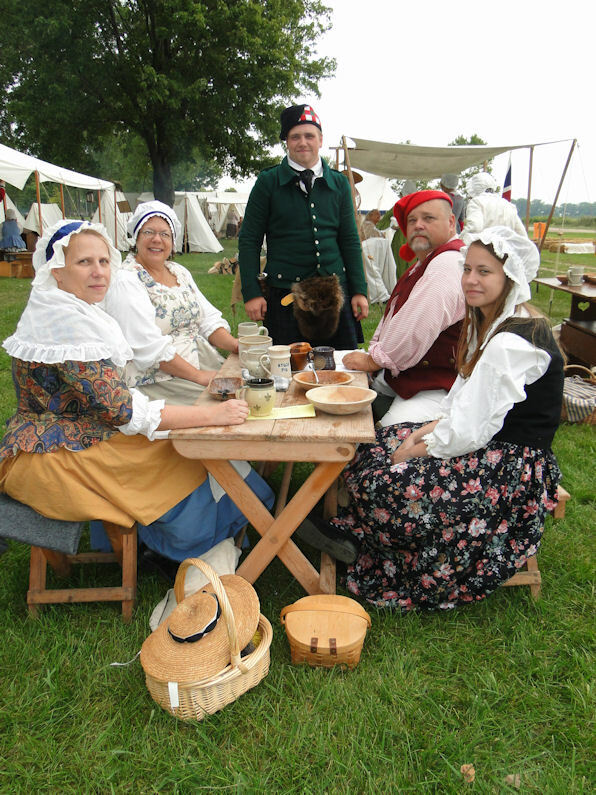 Claire Voyageurs, a group of adventurers who are unique to this general region of southeastern Michigan and what is now Ontario, Canada. 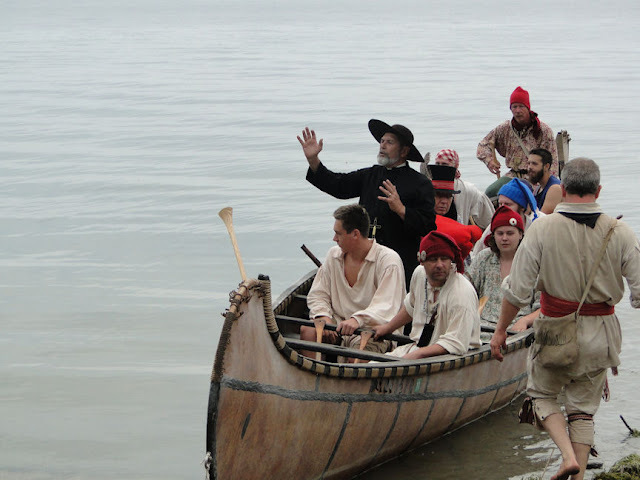 The Voyageurs were Great Lakes fur traders, missionaries, and explorers that came to the area in the early 1600's. They were of French origin, though they did not come directly from France. Rather, they came from the large French settlements in Montreal and Quebec. From the 1670s until the 1800s, these fur traders and homesteaders started settling in the Macomb County area of Michigan, not too far north of Detroit (founded in 1701). I find this very interesting since Macomb is the county in which I have lived nearly my entire life. The Voyageurs befriended, learned from and intermarried with the local Indians who were already here when they arrived. 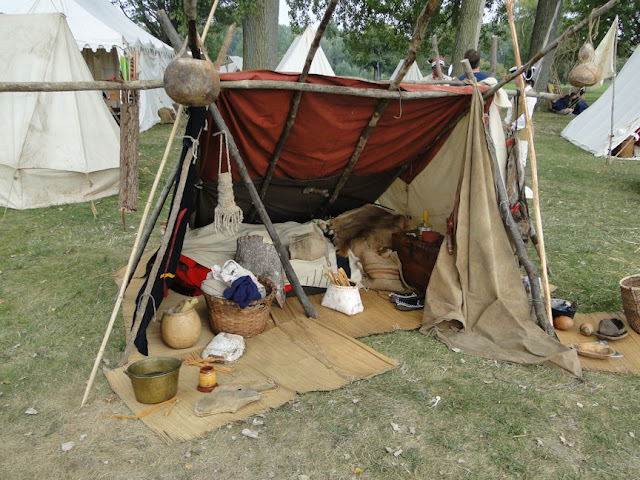 They built earthen huts and farmed "strip farms," which were long pieces of land beginning at the narrow end near the lake and extended inland for about a half mile with a width of about 500 feet. 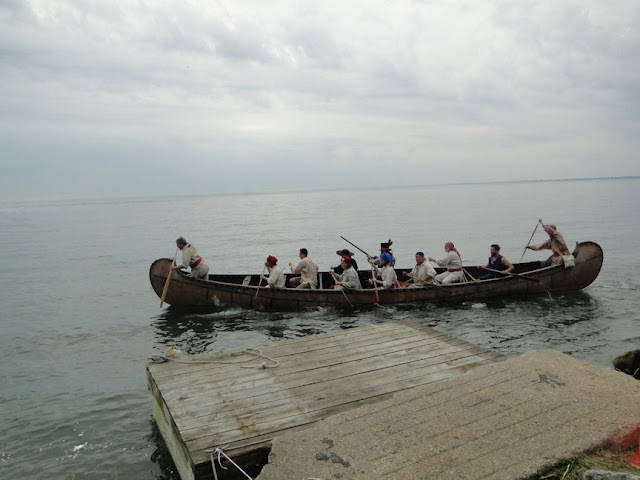 In this way they were able to take full advantage of the natural waterways of the Detroit and St. Clair Rivers as well as Lake St. Clair itself. 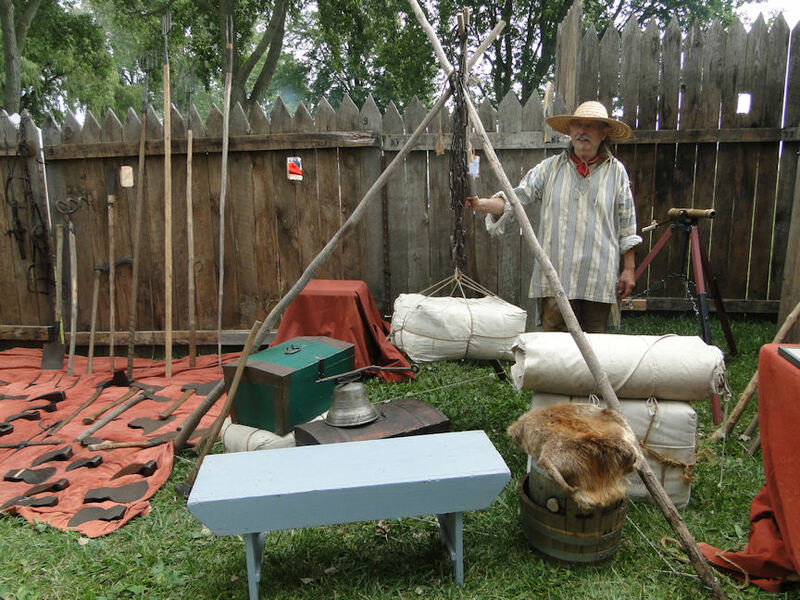 The Voyageurs were known for buying, selling and trading animal fur and pelts. 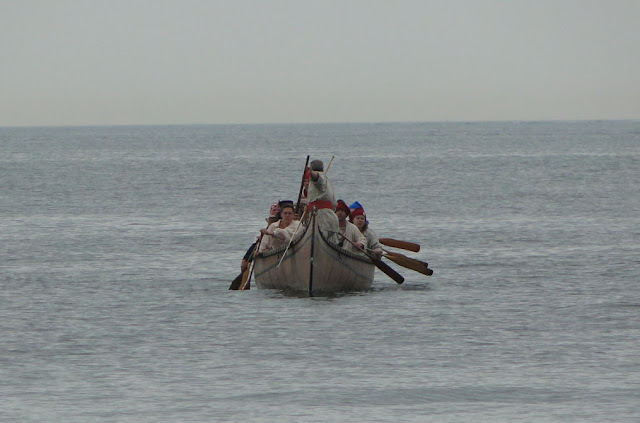 They adapted the Indian-style canoes and bateaux (a small, flat-bottomed rowboat used on rivers) to move their furs, as well as using sailboats. Now, in the 21st century, the Ste. 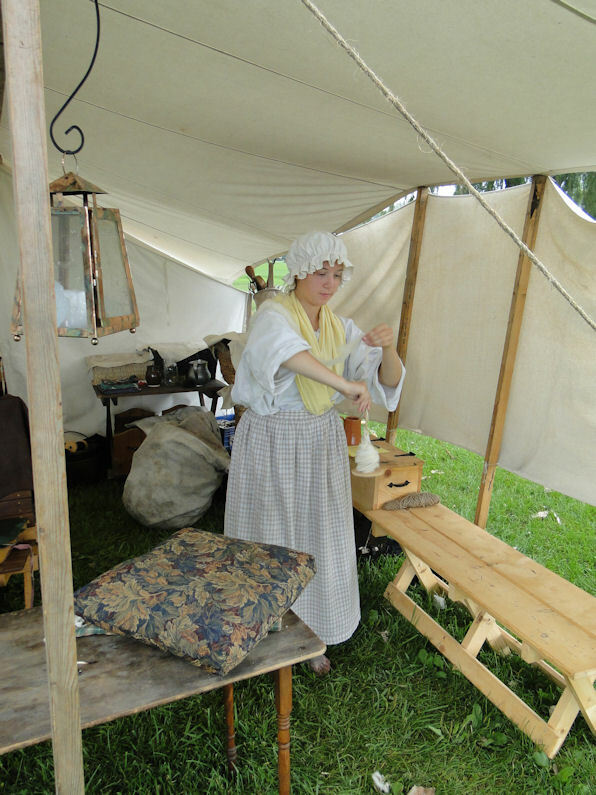 Claire Voyageur reenactors/living historians recreate this life from the 17th, 18th, and early 19th centuries. 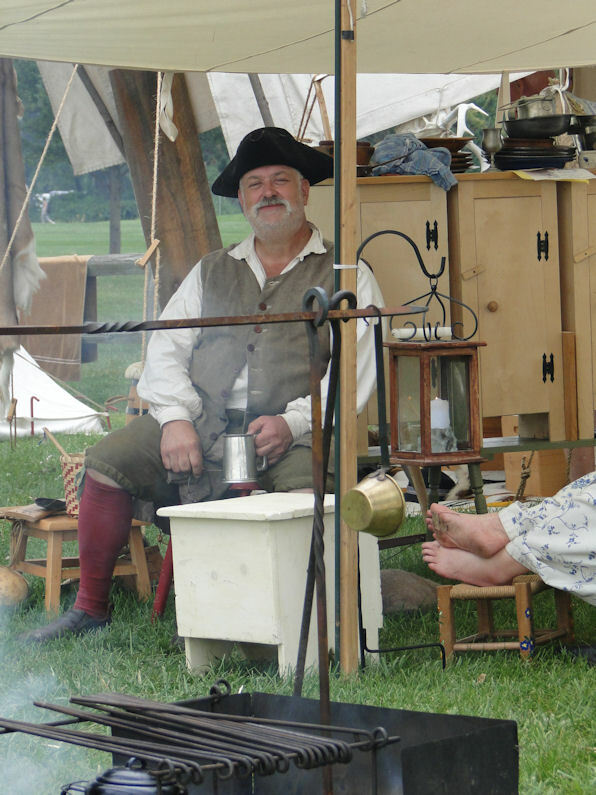 I have visited their encampments numerous times over the years and have befriended a few of these fine folk. 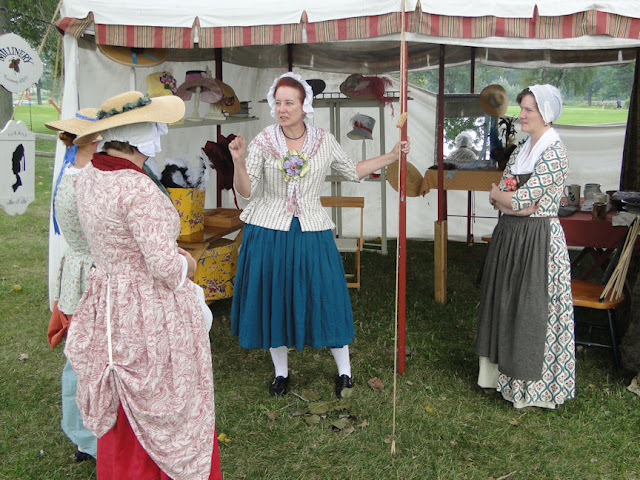 And this year of 2015, for the first time, I got to participate in one of their reenactments. 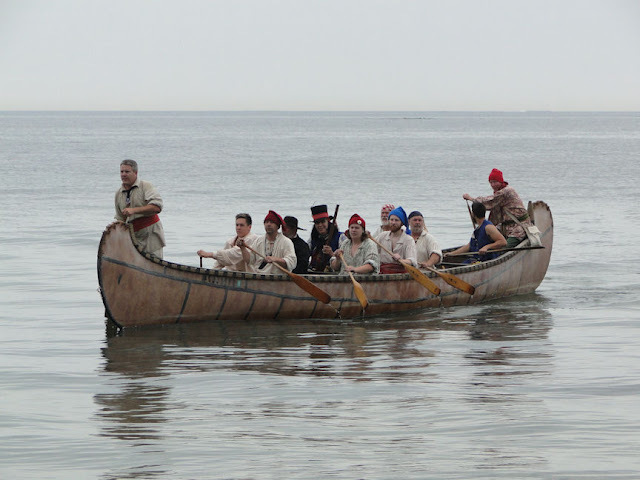 No, I'm not claiming to be a Voyageur, for I do remain an 18th century east coast colonist. But I was invited to take part and to share my knowledge of this period in time, and I was honored to do so. It was quite different to be among this unique group of living historians, and they welcomed me with open arms. 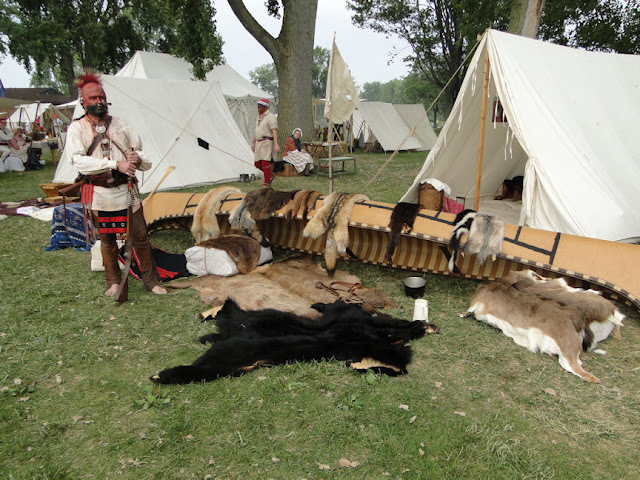 The Voyageur reenactors really do a great job teaching the history connected with the original Voyageurs, Coureur de bois (French/Indian trapper of the Great Lakes), early settlers, and military of the Great Lakes fur trade era. 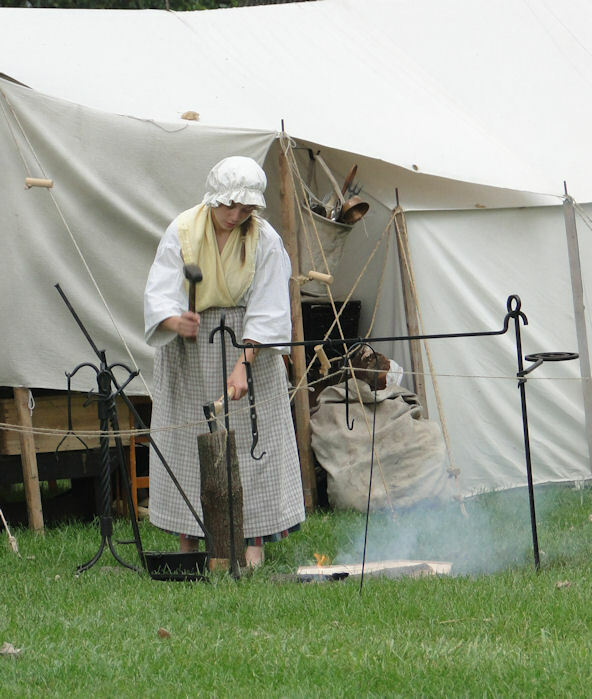 Their living history reenactments of the lifestyles and skills of the region include demonstrations and displays of canoe building, traditional crafts and skills, trade goods and artifacts, blacksmithing, campfire cooking, cannons and weaponry. 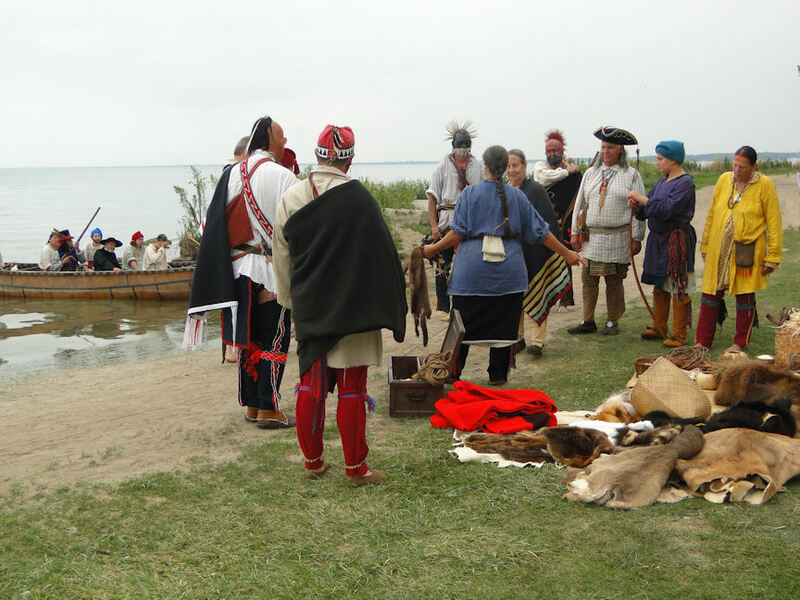 They also play music, dance, tell stories, give lectures and just do a fine job teaching about the general history of this long ago culture - a part of American history greatly over-looked. 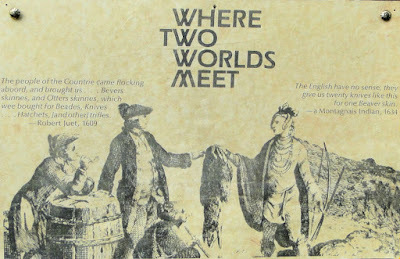 Two worlds meeting...and getting along. 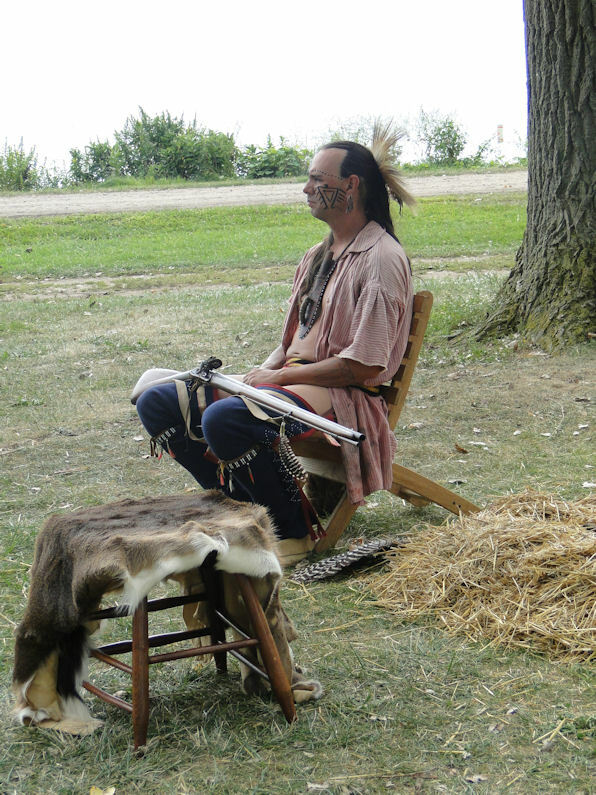 Normally we only hear of the Western and Plains Indians, so seeing those who once lived in my local area was very cool indeed. 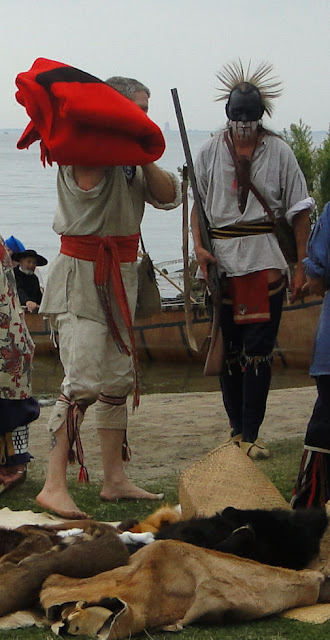 From what I’ve read, there were eight indigenous tribes that lived in what is today the state of Michigan (or Michigamea, an Ojibwa word meaning "great water"). 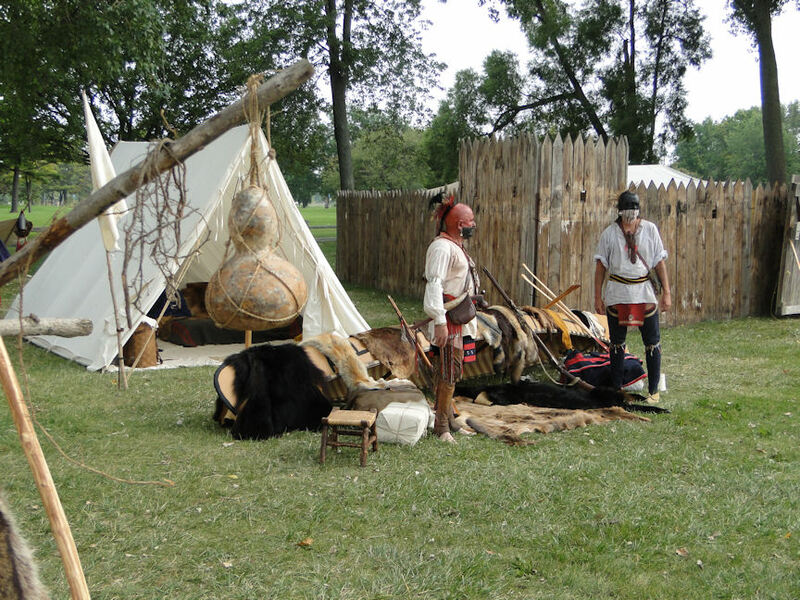 They included the Algonquian, Huron, Menominee, Miami, Ojibwa, Ottowa, and Potawatomi, as well as the Wyandots. The canoes of the Voyageurs typically were made from the bark of large paper birch trees stretched over a white cedar frame. 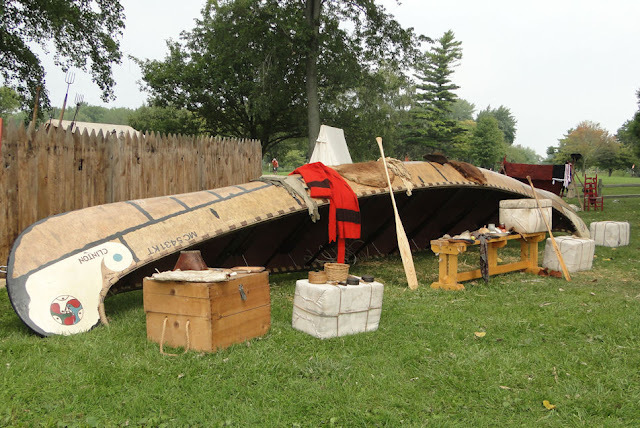 There were several sizes available for use, two common sizes, the larger (approximately 36-foot long) "Montreal Canoe" and the approximately 25-foot long "north canoe". The Montreal canoe was used on the Great Lakes, and the north canoe was used on the interior rivers. Home is where your canoe is. 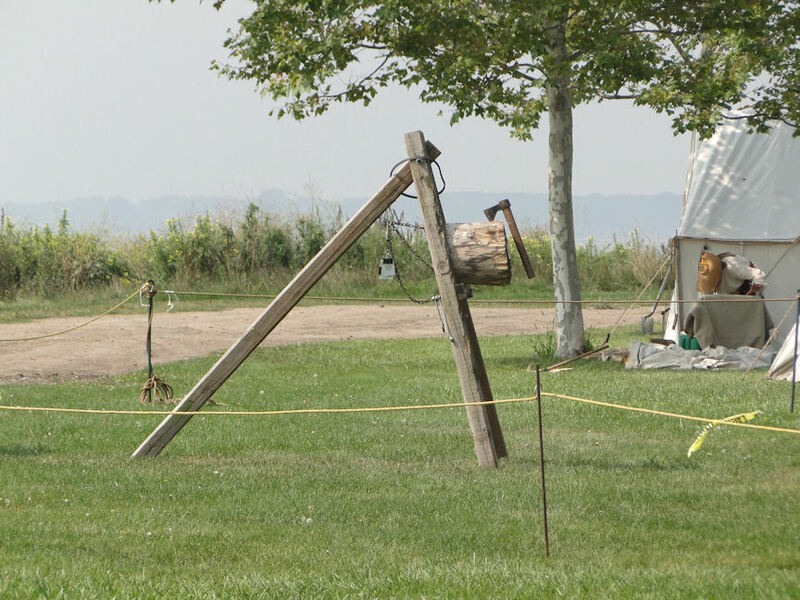 Practice your hatchet throwing here. 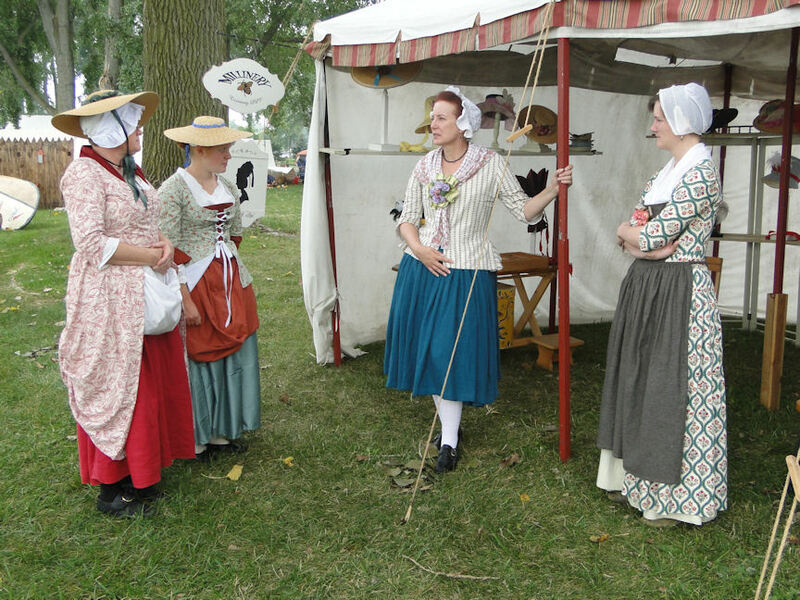 The pathway along Lake St. Clair was lined with tents, and I met up quite a few people whose fashions were quite interesting indeed. 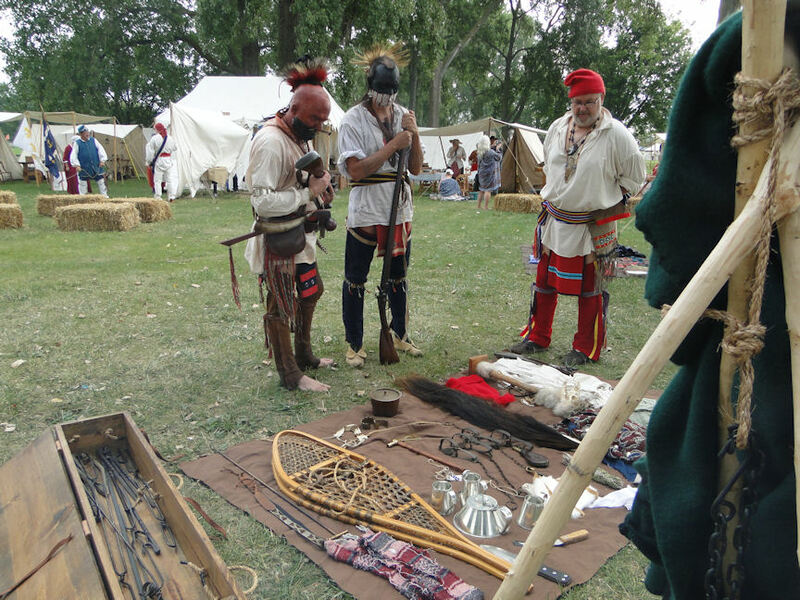 You see, the mixing of Indian and European cultures seeped over into the clothing fashion, and it's interesting to note the more adventurous styles that came out of the blend, though we still will find the more traditional fashions in both camps. These ladies I am proud to call my friends. Their knowledge of the 18th century (and even 19th century) is very extensive. 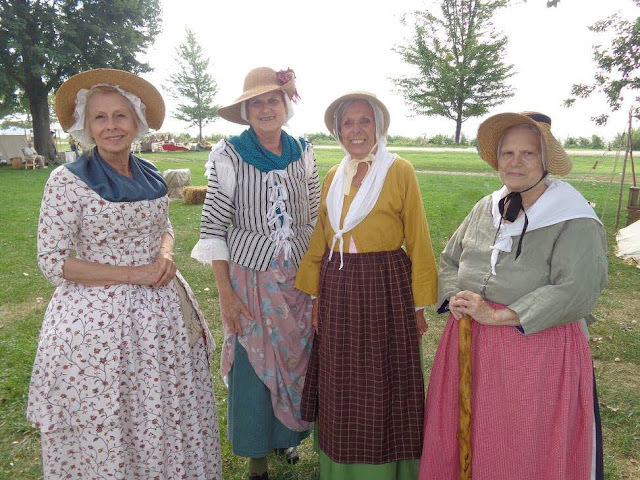 Two used to work at Greenfield Village years ago, another's husband worked at the Village as well, and another has been reenacting the Civil War for decades and now decided to try something new...er, old...er, different! Me and my son, Rob, flank Mrs. Paladino. 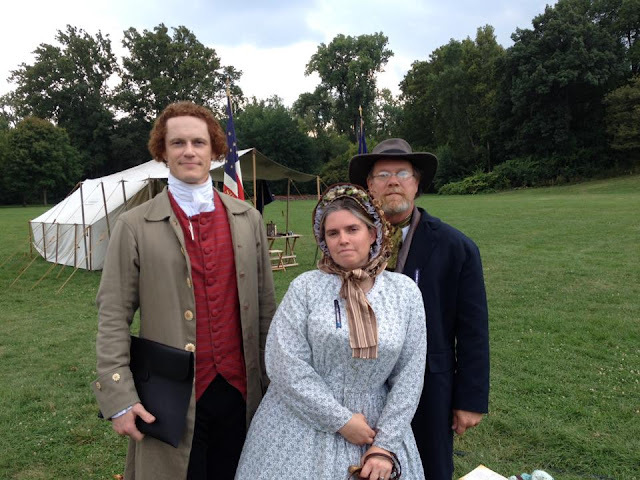 The three of us also reenact the 1860s. While many from the Civil War reenacting community have added WWII to their living history excursions, the three of us, along with a few others in our Civil War unit (21st Michigan) have, instead, chosen to go even further back in time and add the Revolutionary War to our already busy schedules. Yeah...I'll take reenacting the colonial era over the modern 1940s. 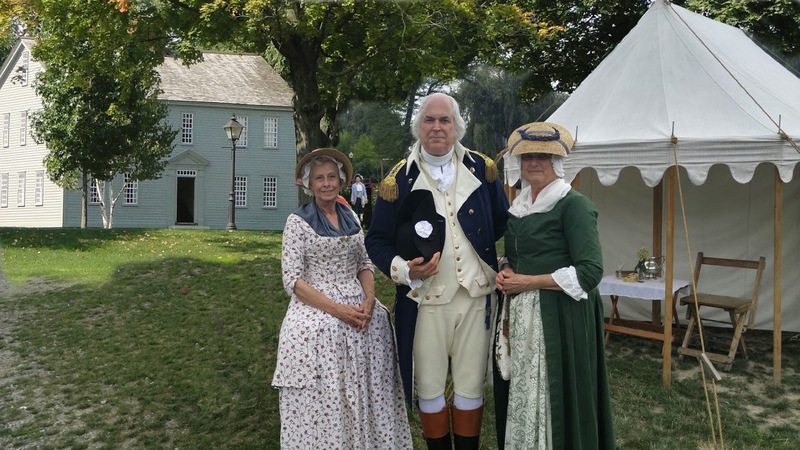 Now let's visit the Church's, a fine family of RevWar-era reenactors who I had befriended my first time out. 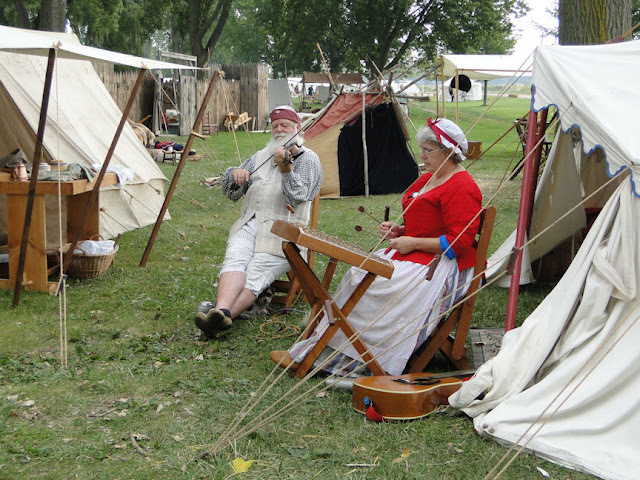 They, too, have a long "history" of reenacting that goes back to the grandparents of the kids here. It's a family tradition you know. 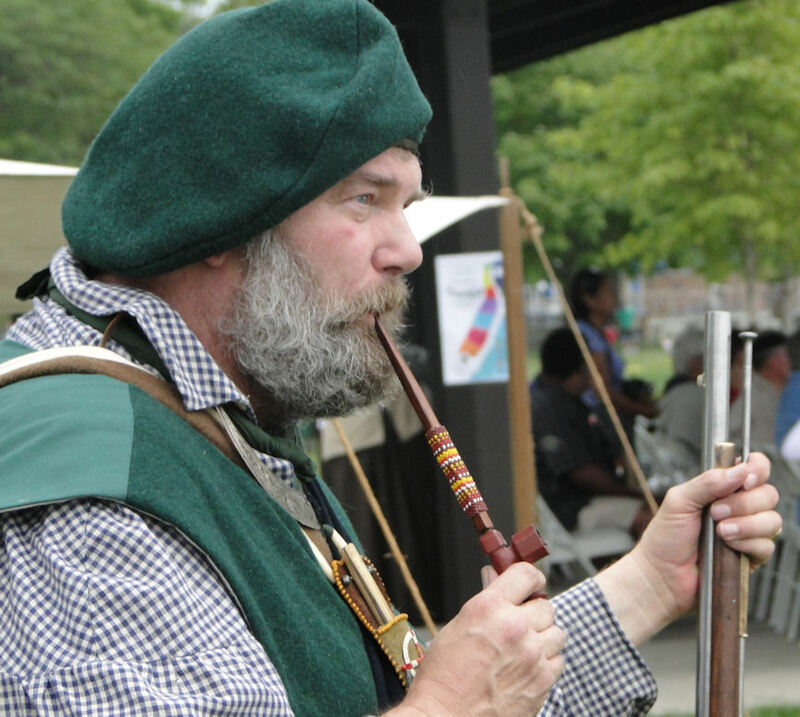 There's just something about period music played on a hammered dulcimer and fiddle. I have numerous tunes in my CD collection, but hearing it live is all the better, and these two were excellent. No matter the age or the gender, chores needed to be done, including chopping wood, as this young lady shows. Ahh...here's my old friend Joe Flatlander (aka as Glenn!). Joe, besides being one of the nicest guys you'd ever want to meet, is also a fine blacksmith as well. 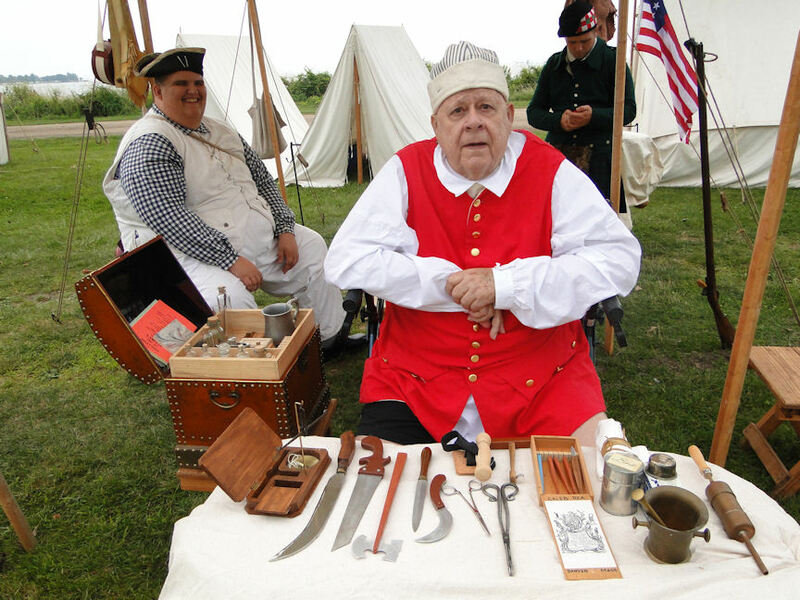 If you recall the recent posting I did about the Jackson Civil War event, you might remember this guy. 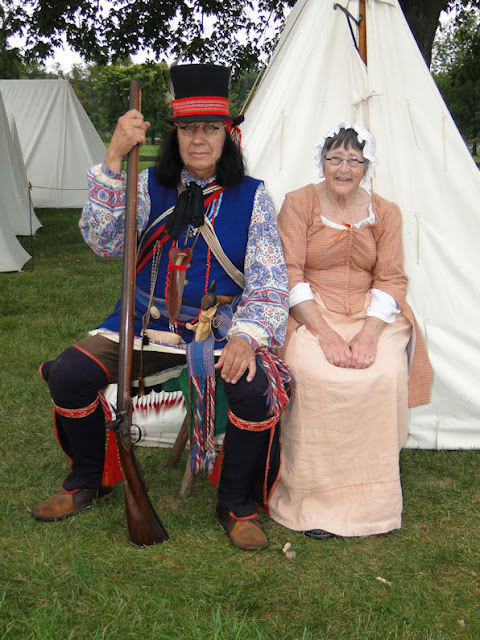 He has been reenacting for over 40 years, has done Civil War, War of 1812, Rev War, and French & Indian War. He had also portrayed President Lincoln many moons ago. 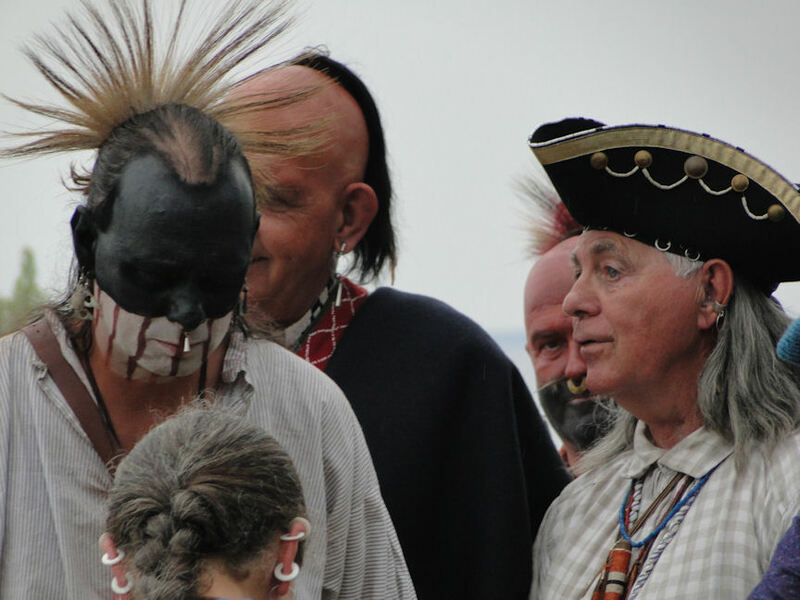 He was even an extra in the F&I flick "The Last of the Mohicans" starring Daniel Day-Lewis. A good guy, this man. 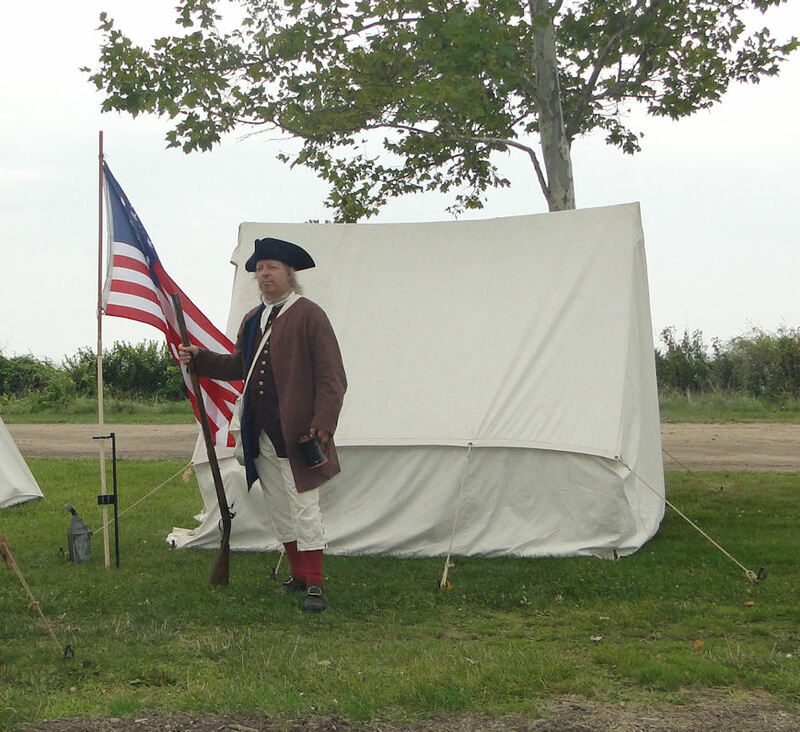 Remember what I said about how friendly the reenactors here were? Unfortunately, I don't always remember names, so I apologize to this gentleman for forgetting his. But he was a very nice guy to speak with. I was trying to be a little artsy when I took this photo at the milliner's shop: it's a bit hard to tell, but if you look in the mirror in the center of the picture, you can see the back of the woman who is wearing the blue dress. 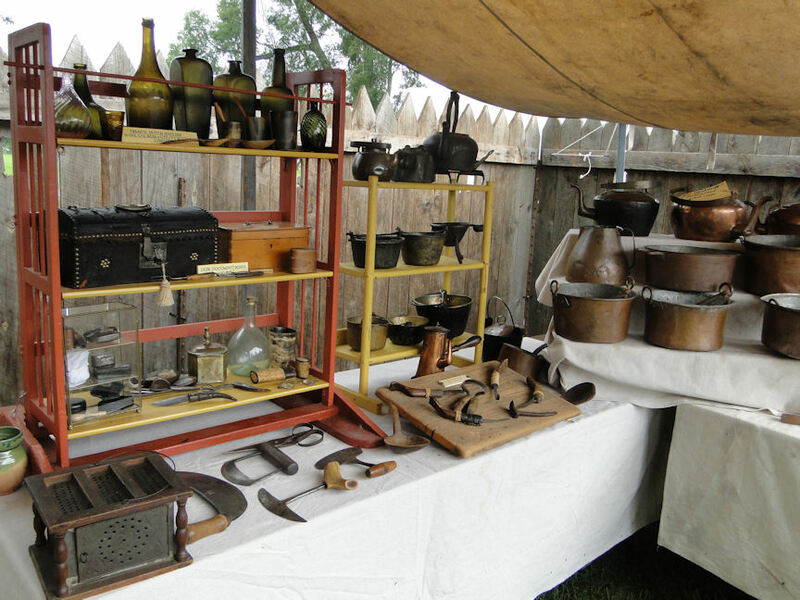 As I continued moving along, I found some fine period displays in front of many of the tents. Something in particular caught my eye in this collection - - the Betty lamp there on the right. I am hoping to add one to my lighting collection. Something else I wouldn't mind having: a horn book (lower right). Yeah...there's some cool colonial-era replicated items out there. 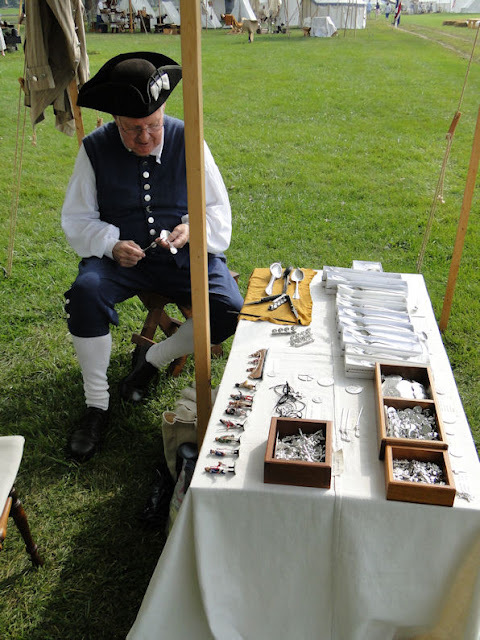 This gentleman had a fine collection of medical tools. He is the grandfather of the young guy you see sitting behind. Another generational reenacting family. 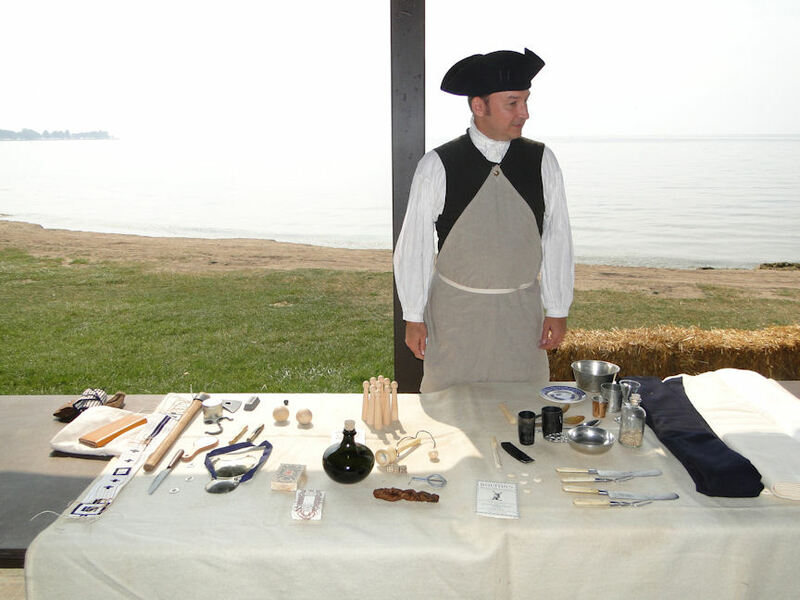 Here we see Jeff all set up to give a presentation to show (from left) common tools, amusements (center), and home necessities (right). 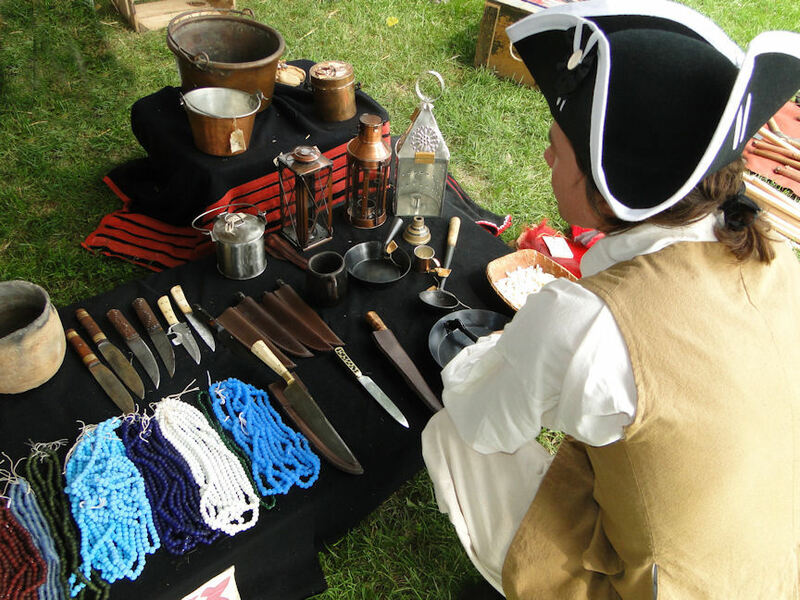 This man reminds me of me in the Civil War world where we like to show the every day items the more common folk used in their daily lives. I thought this lean-to had a great primitive, very 'woodsy' look to it. I've seen sketchings of 19th century frontiersmen using similar styles. Here are a few things you may need as a Voyageur, including snow-shoes (on the right). 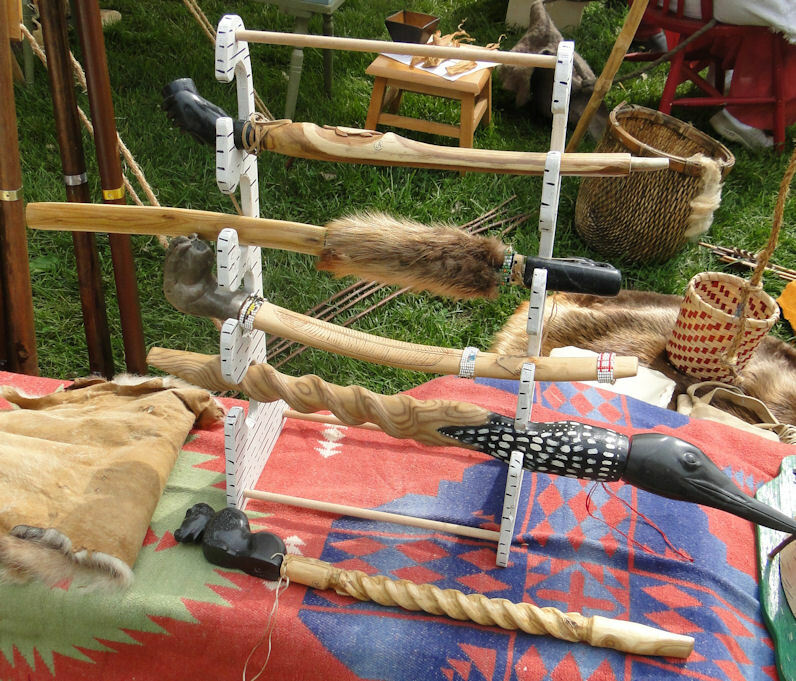 Handmade pipes from horn, clay, and bone. 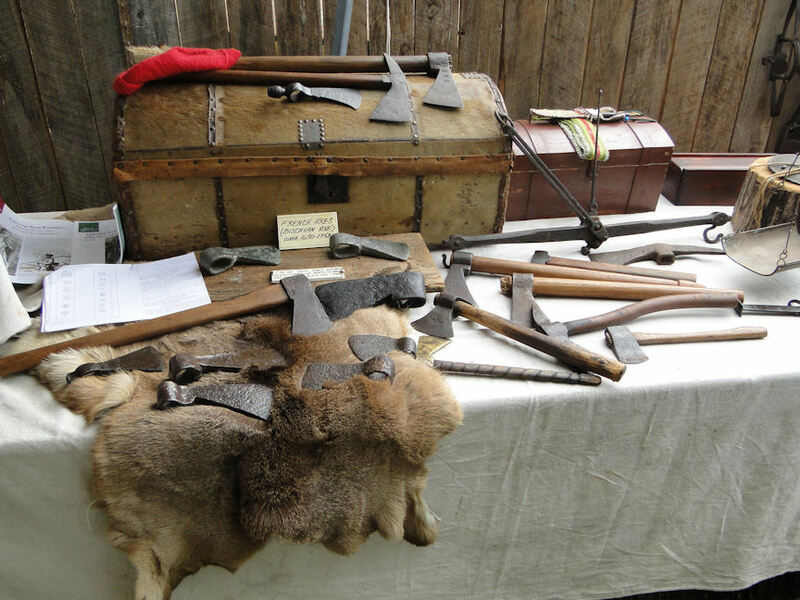 You may also need knives and lanterns. 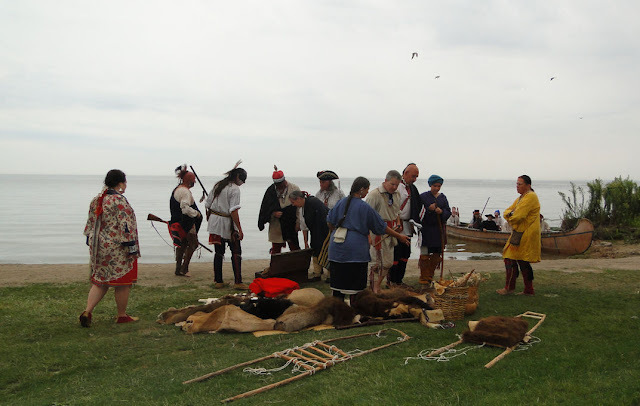 Plenty of trading did go on between the Indians and the Voyageurs. 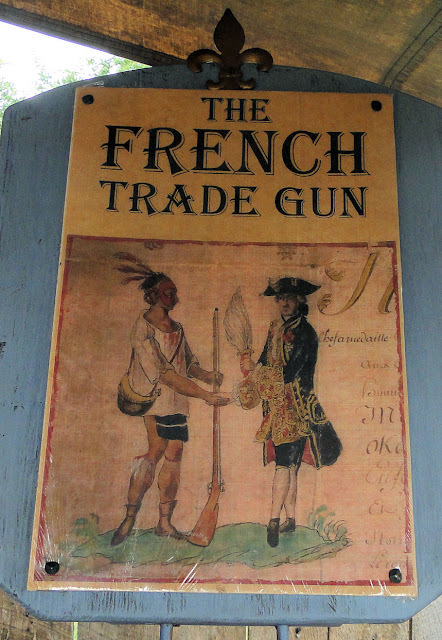 Guns were a top priority for the natives. 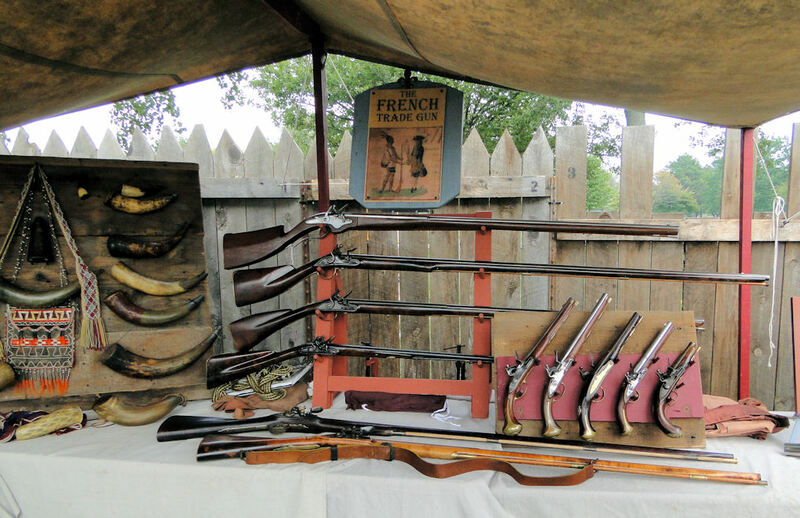 Here are the guns, ready to be traded for pelts. Cast iron and copper pots, bottles, trunks, and even a foot warmer for your lady. The hatchets and axes are, perhaps, the most important tool a Voyageur could have, aside from his musket. Trunks are good to have, too. 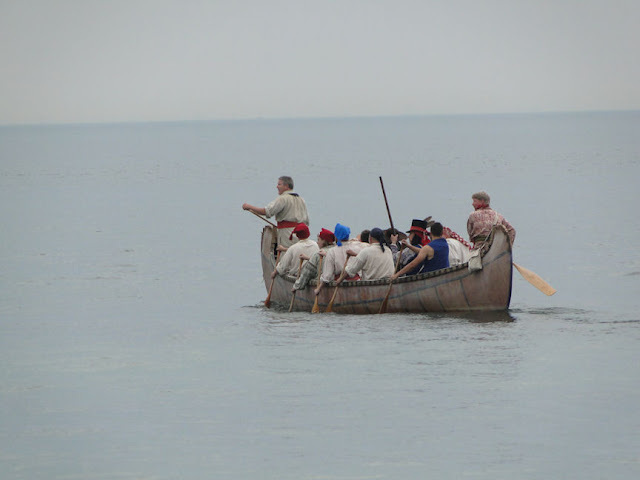 Remember that large canoe a few photos up? Yes, can you help me load my goods on to it? The next few photos show a few of the many crafters working their trade. The people here were very knowledgeable and happily explained what they were doing. Here is a woodworker sitting on his shaving horse carving a block of wood into a canoe paddle. It was fascinating to watch as he expertly worked his craft. It did not take him very long before it was completed. He's pretty close to being done in this picture. Meet Mr. Jim Strode, pewterer. As he advertises, he makes "the finest of hard metal pewter." 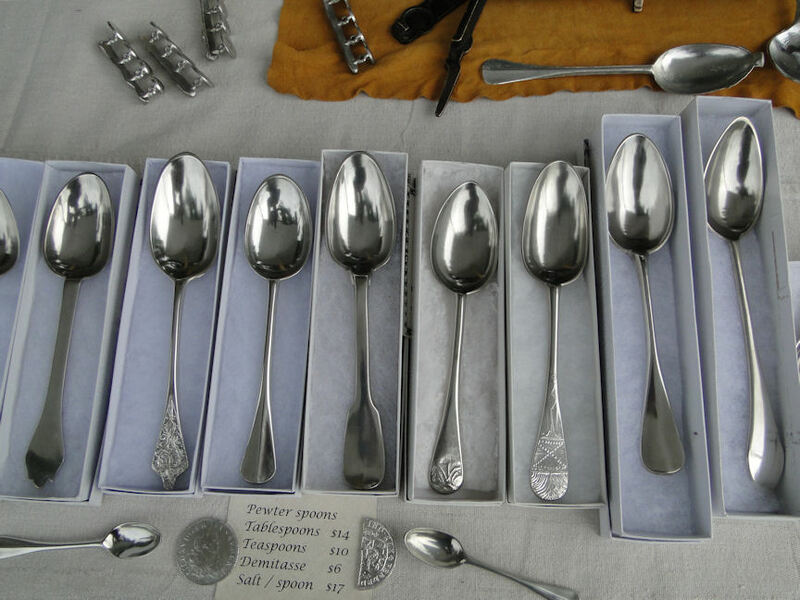 At the top we see a newly formed pewter spoon still in the spoon mold. 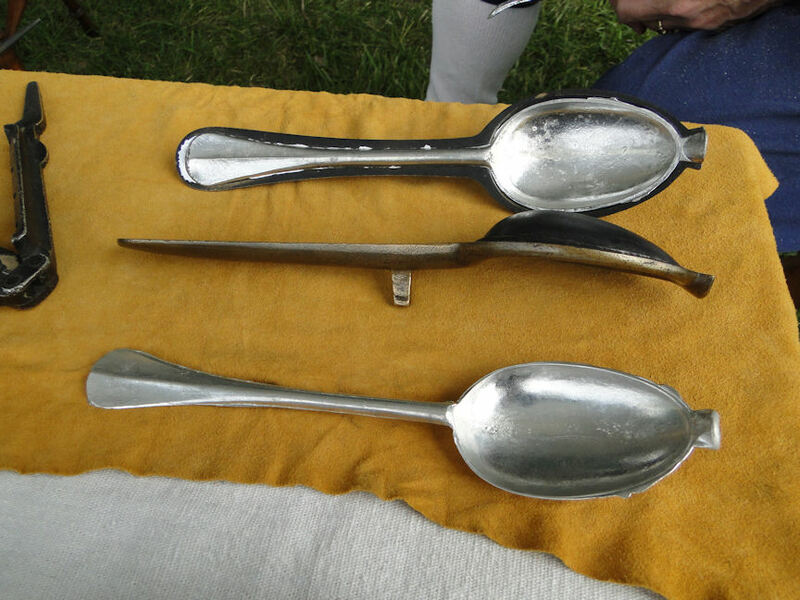 Below that is the spoon mold itself. At the bottom is a spoon directly out of the mold, waiting to be smoothed and filed. The finished product. Yes, he sells what he makes and makes what he sells. They truly are a beautiful work of art. 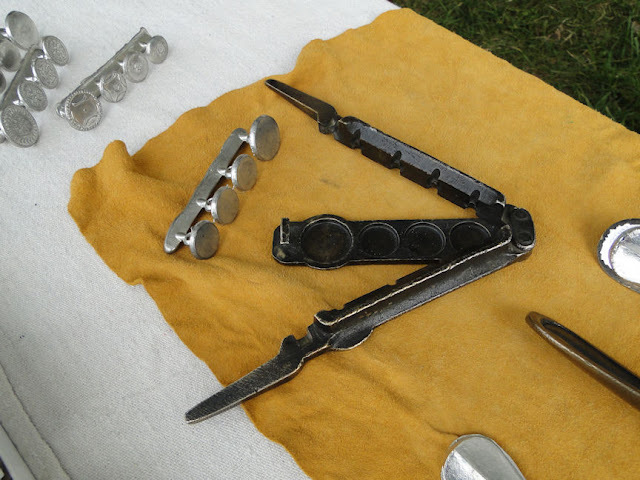 Mr. Strode also makes pewter buttons from his button mold. I believe the mold pictured here is an antique. There were numerous styles of looms about. 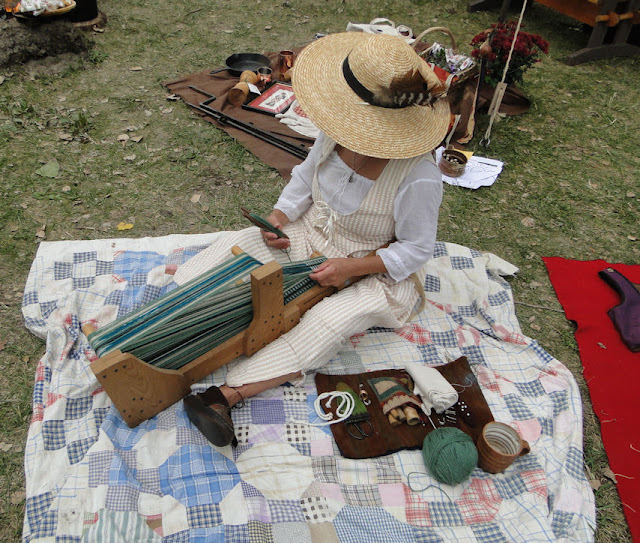 Here is, I believe, a type of lap loom. 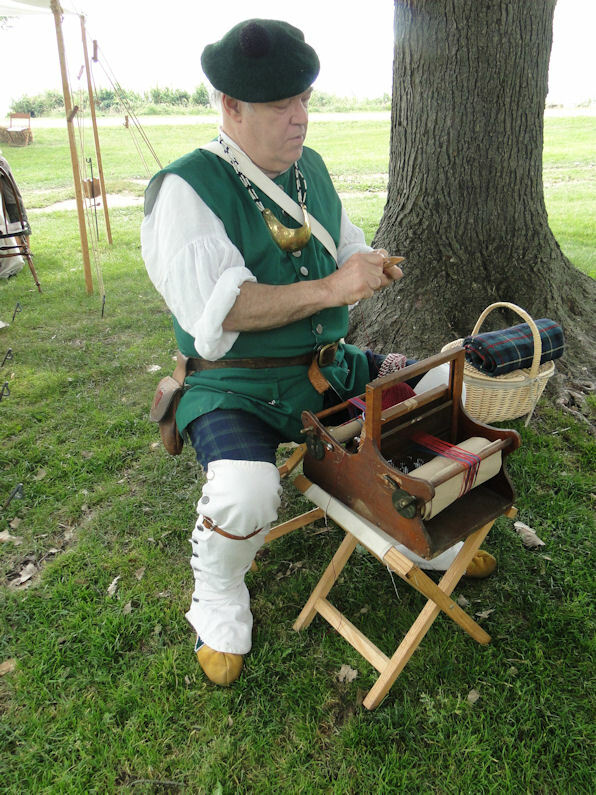 Ross Grover makes a belt with a tape loom. 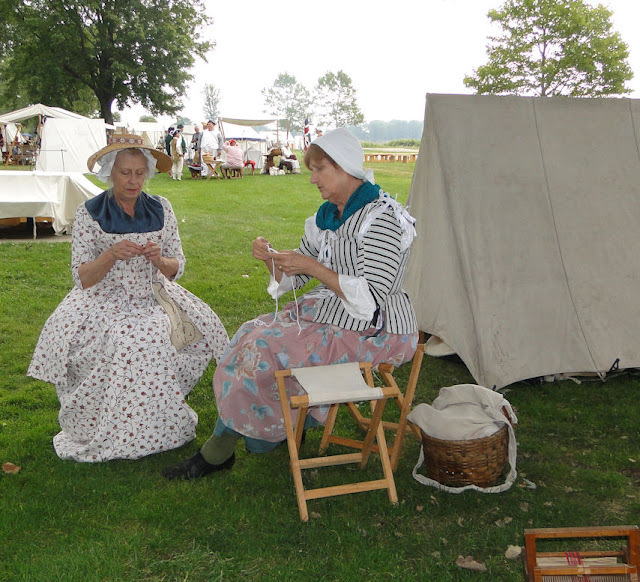 Mrs. Paladino and Mrs. Grover are hand-making cording for bodice lacing, petticoat ties, etc. This young lady was a master at using the drop spindle. 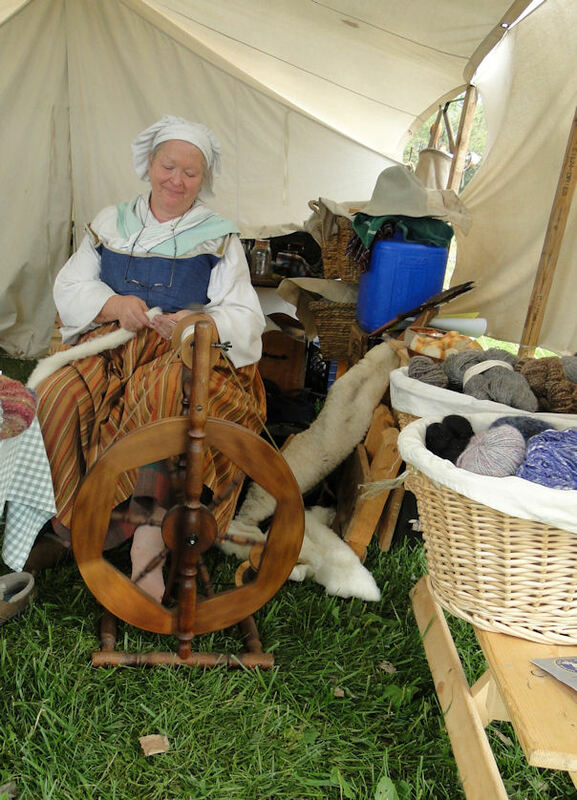 And I believe this is her mother using a spinning wheel and showing some of the wool she has spun into yarn. As I wandered through the village, I came across this woman who had "brain-tanned" a hide using traditional Indian methods. By the time I had taken the following photos, the early parts of this process were already completed, but it's something I've read about but had rarely gotten to see. Brain tanning hides is a lot of work. It's a very labor intensive process that uses an emulsified solution of animal brain and water to provide outstanding absorbancy to the final product. But what you get at the end of your sweat and toil is an exceptionally soft hide that stays pliable even after it gets wet. Nevertheless, the process of tanning hides by hand using the animal's brains, is not for the feint of heart. At the end of a hunt there's usually no time to tan a hide because the priority is to process and preserve the meat. 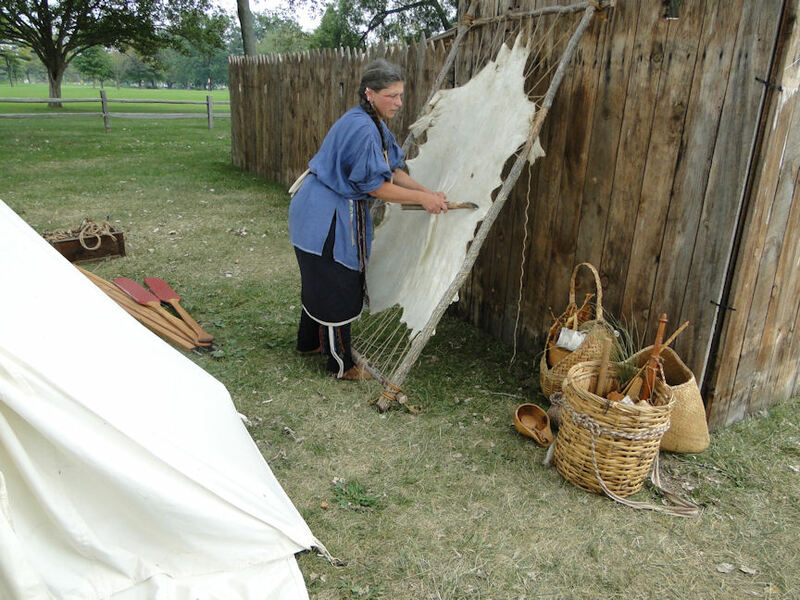 At this point, we used to tie the hides in a bundle and string them high up in a tree safe from scavengers...not porcupines, though! When they were removed from storage they were often dirty...and always smelly. When the time comes to begin the brain tanning process, you have to first soak the skins in water for a few days to clean and soften them. If you have access to a handy dandy lake then that's the easiest way to go. City bred wives tend to fret if they find you've taken over the bathtub for this purpose, so if a lake isn't close by, call on your creative side. Then, without doing damage to the rawhide itself, you're going to have to scour the skin to remove bits of flesh and fat. This first fleshing can be done over a wide log using a carved leg bone as a scraper. Using your bone or steel scraper remove the grain. The grain is the name given to that part of the skin where the hair grows. You have to work hard and be sure that you scrape off every last bit of grain because otherwise your hide will be stiffer than it should be and won't take the smoke evenly later. When you're sure you've got rid of the grain spread the hide out in the sun to dry...it won't take too long. Drying helps with the next step. Now it's time to turn your attention to the inside of the hide. You're going to scrape off the membrane layer which is where the blood vessels are. Before you start you have to wet the hide again. Soak the hide for about fifteen minutes in the handy dandy lake. Place the hide back over the log and methodically scrape off the membrane. 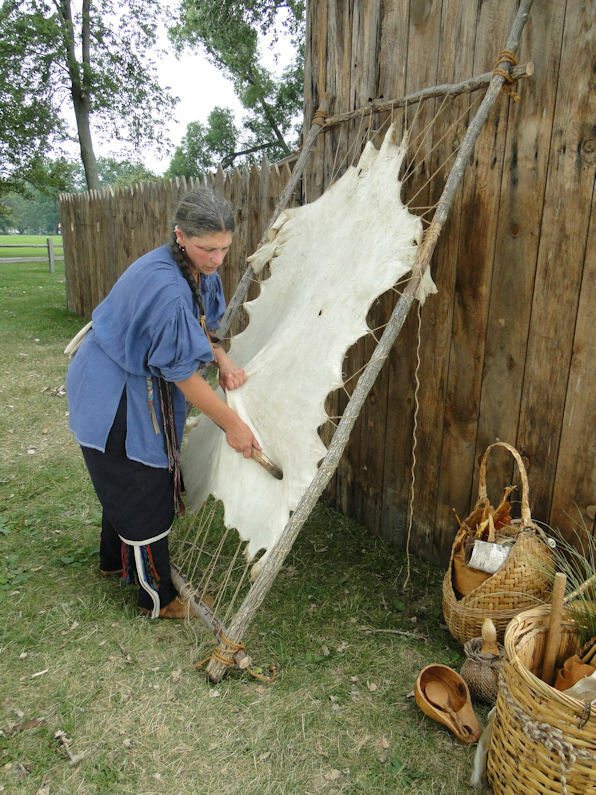 If you leave any in place the finished hide will be stiff and won't accept the smoke in the tanning process. The point is to end up with a hide that doesn't have any holes or knicks, so any scraping is best done with a deer leg bone or a blunt iron flesher. The tanner's aim at this point is to remove every...EVERY... bit of flesh and fat, including the paper thin epidermal layer between the carcass and the outer hide. When you think you've done an excellent job you have to find a way to rinse the hide in running water overnight. It takes a LOT of rinsing. Said lake would do the trick, but a creek would be better. If the hide is small you could put it in a five gallon pail and run a stream of water from a hose all night long. You're trying to get to the point where your hide feels loose and thin. It will take awhile and at first will seem to get thicker so don't fret. Just keep rinsing. Worse case scenario is that you'll have to do fling it over the log again for more scraping time. Next morning wring the hide thoroughly. 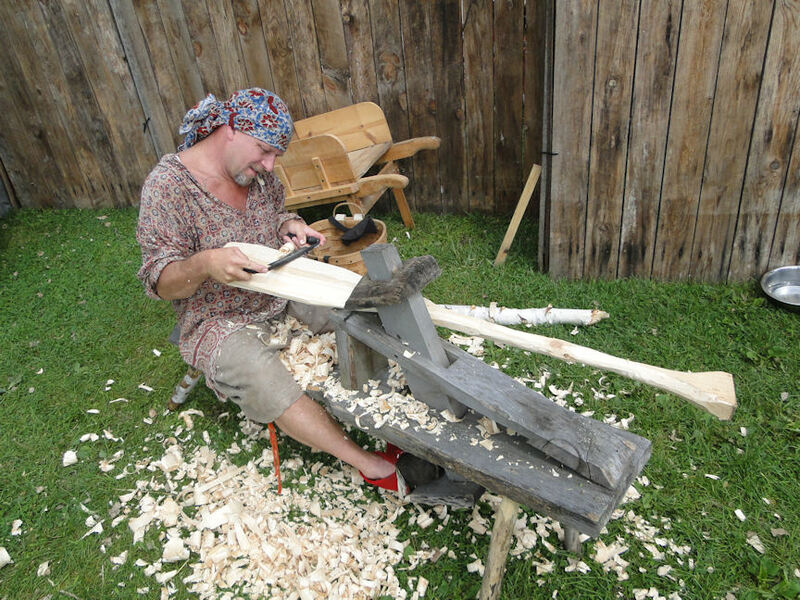 Rig up a wringer on a deck railing or heavy tree branch and ask a friend for help if its a big hide. You have to wring in one direction, then the other. 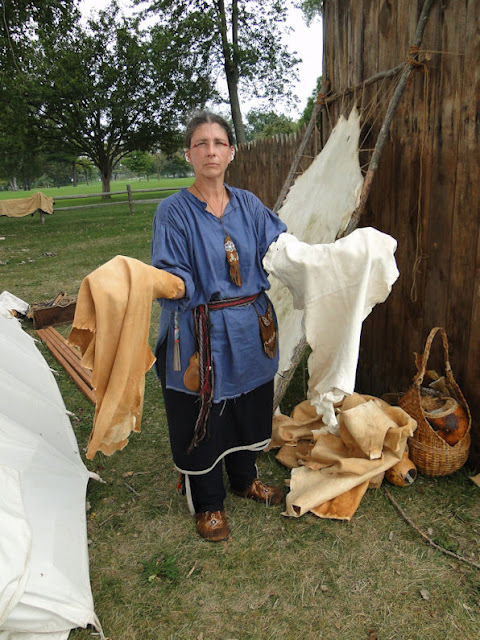 Now you're going to have to stretch the hide as wide and evenly as you possibly can. 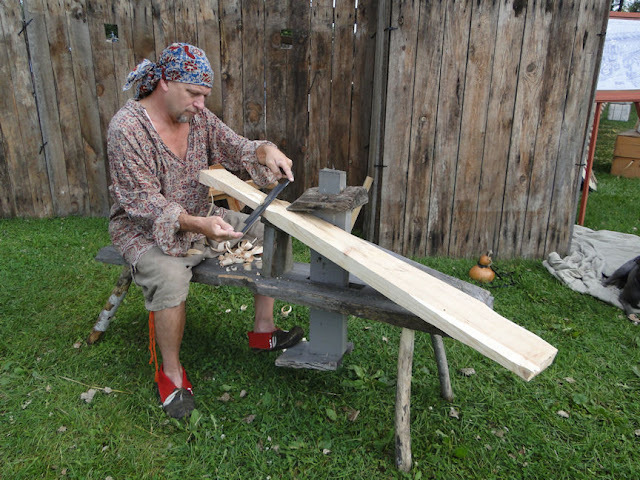 Usually you can do this on a frame made of poles that you lean up against a couple of trees or your cabin. The prairie tribes used to stretch the hide between stakes pounded into the ground so I guess that's an option. 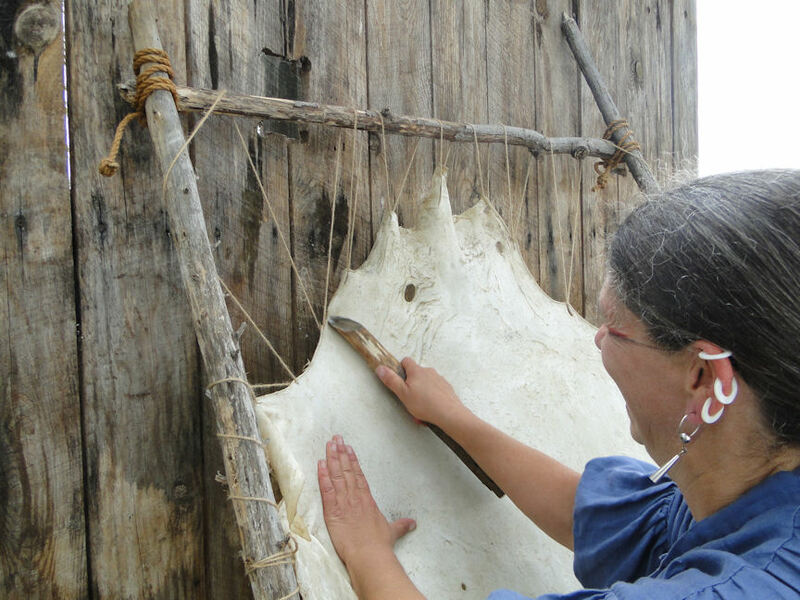 The further you can stretch the hide at this point, the larger the final piece of leather. The next step really depends on what will eventually become of the hide. If the hide is intended to be made into a rug or warm winter coat only one side of the hide needs to be scraped, because the hair doesn't have to be removed. 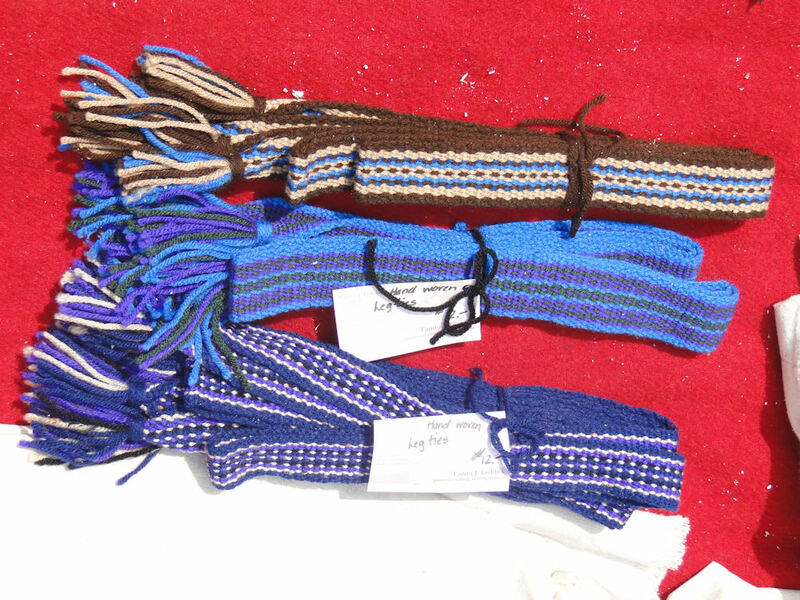 But if the intention is to make moccasins, a jacket or other piece of clothing, all the hair must be removed from the skin. 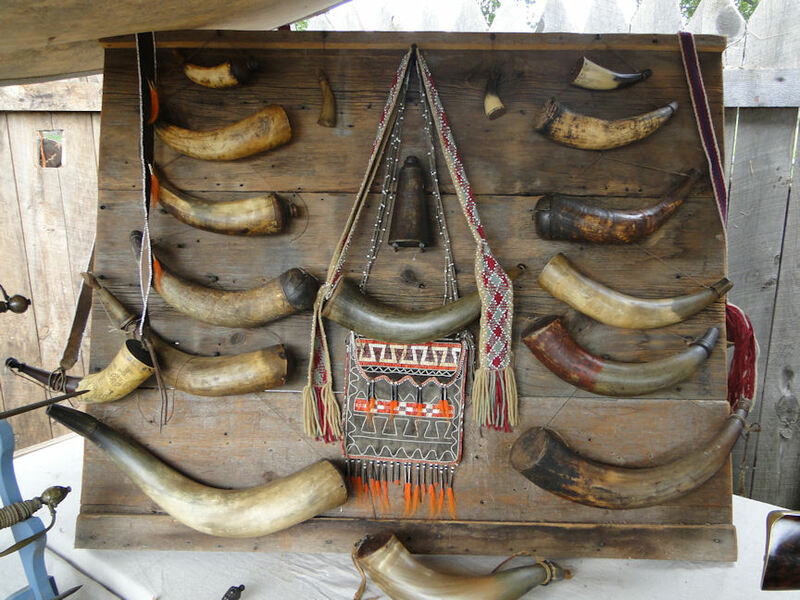 Some animal hides are better suited for one purpose than another. Deer and moose make useless rugs, but great footwear. Wolf and fox fur stand up to some abuse and are also good for embellishing clothes. Rabbit skins can be tanned but are either ornamental or cut into strips and knit or woven into a jacket or cape. If you want the hair to remain on the hide, of course you don't have to follow through with any of the procedures that loosen the hair. But when you come to the bit about applying the brain slurry you're going to have to be extra careful so that its only applied on one side. The finished product - all done in the traditional way. If the hair is to be removed, then soaking the skin in a mild acid (urine was used in times past, for example), letting the skin putrefy for several months, or painting a sludge of slaked lime (wood ash and water or ground seashells boiled in water) will loosen the hairs. 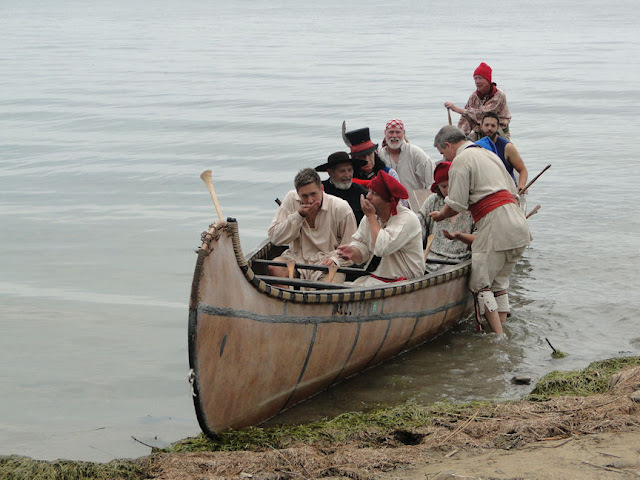 Keeping the historical long-lost crafts alive is so important, and the Voyageurs do an amazing job in this field. 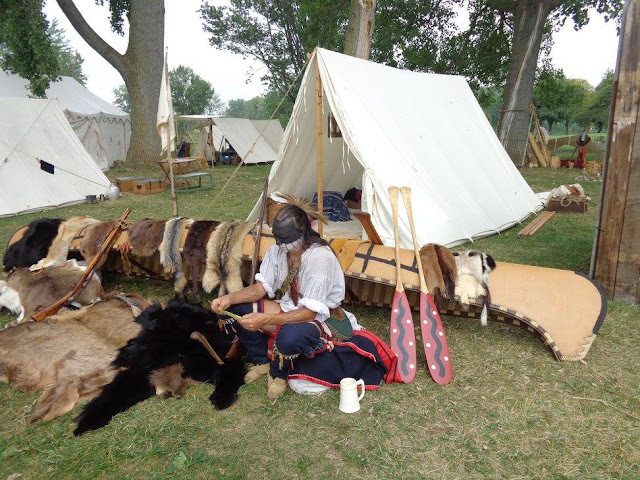 As I mentioned earlier, the Voyageurs were Great Lakes fur traders, missionaries, and explorers, and were known for buying, selling and trading animal fur and pelts. 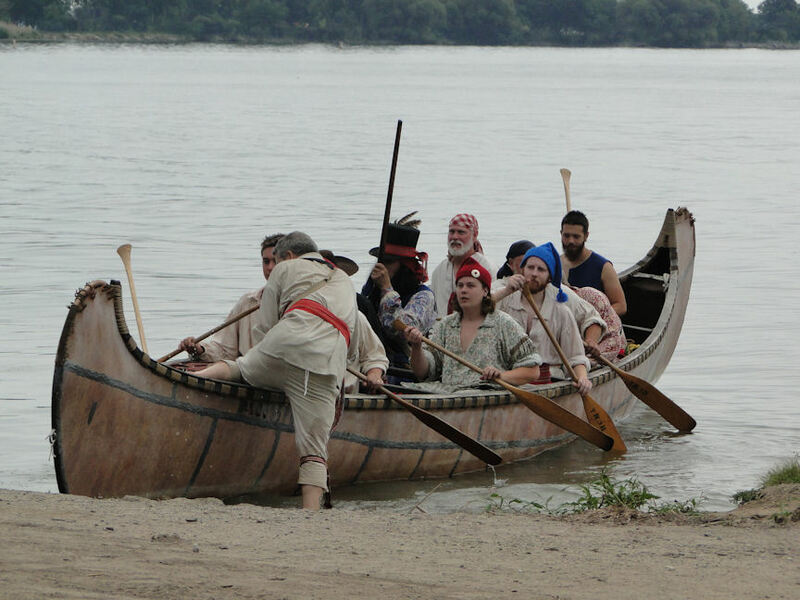 They adapted the Indian-style canoes and befriended, learned from and intermarried with the natives who were already here when they arrived. Taking off from camp, the Voyageurs will travel by water to trade with a local Indian tribe. Out into Lac Ste. Claire (Lake St. Clair) they go. The camp spotted, they head toward land. The Chaplain says a prayer in hopes the trading goes well. Recognize the woman in blue? Yep - she's the very kind person who gave us a lesson on brain-tanning hide! 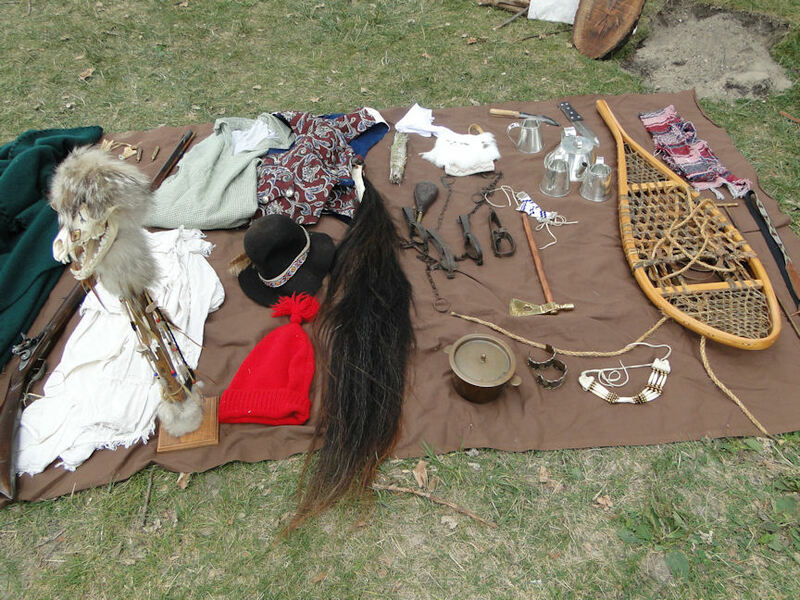 There were all kinds of item available for bartering. 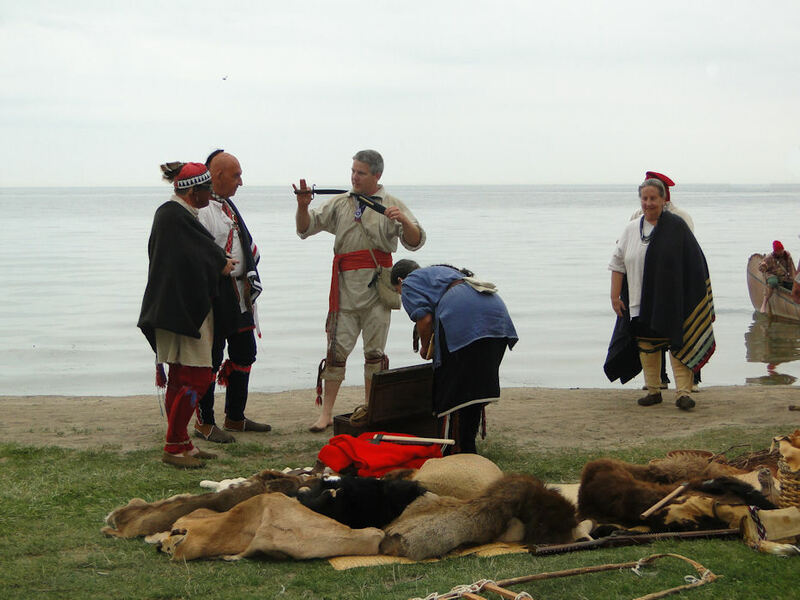 It was very interesting to watch the living historians as they depicted what it was like to trade between the Indians and the white man. The quality of each participant was top notch. Trading complete, it was time to head back to their village. Not only was this my first time participating in this event, but it was my first time ever going to it. Normally it takes place the same weekend as the Civil War Muster in Jackson (Michigan), but this year, for some unknown reason (and lucky for me! ), Jackson took place the previous weekend. Hey! Hey! That left Voyageur weekend open! 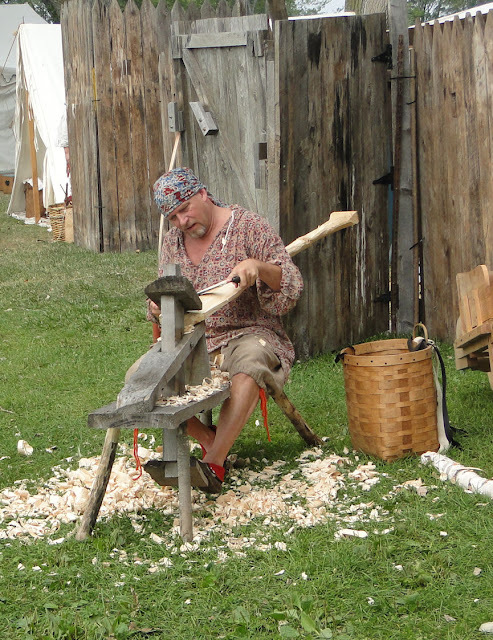 And what is really impressive about the Voyageurs is seeing all of the traditional crafts that they do. 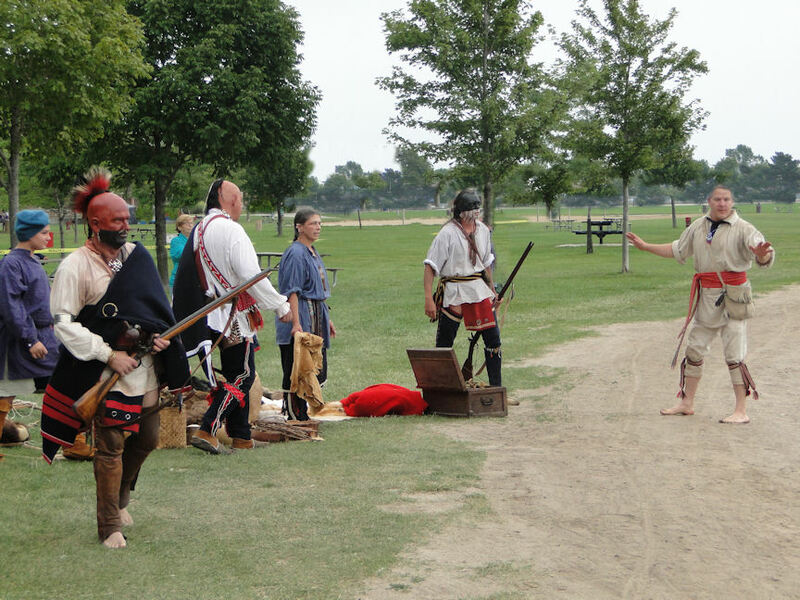 Now, if you ask me to compare Colonial-era reenacting to Civil War reenacting, well, that is an idea for a future blog posting, for there are some very distinct differences. 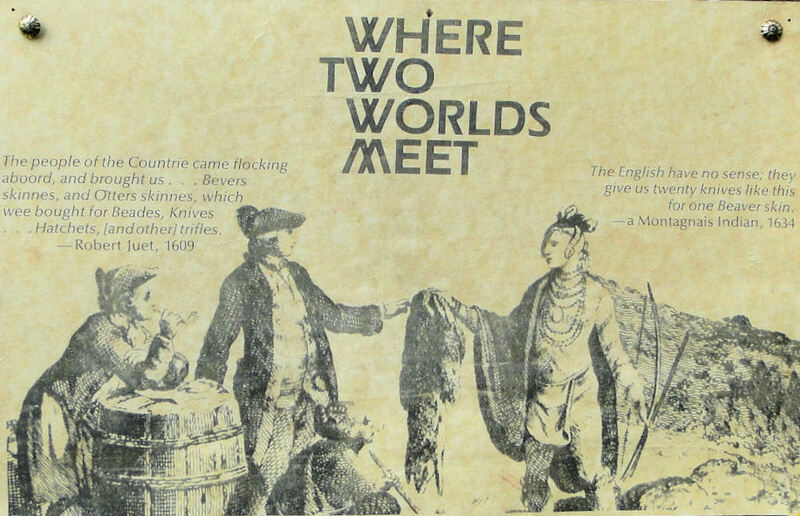 Anyhow, I hope you enjoyed my little excursion to a place one doesn't think of very often when they think of American life in the 18th century. 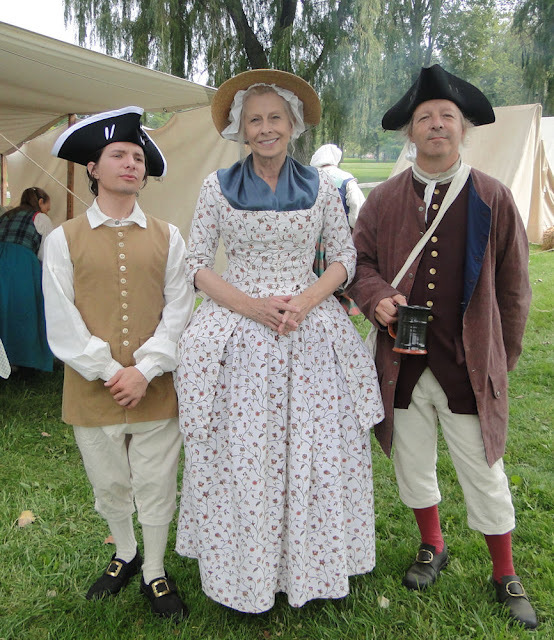 this same weekend, on the other side of town in Dearborn, occurred an event that I, unfortunately, could not attend called "We Humble Ourselves - Turning a Nation Back to God," which was a patriotic concert/ceremony featuring a symphony orchestra, a choral group, a drum and fife corps, and living historians representing historical figures showing something that many in our modern times seem to deny - this nation's Christian heritage. 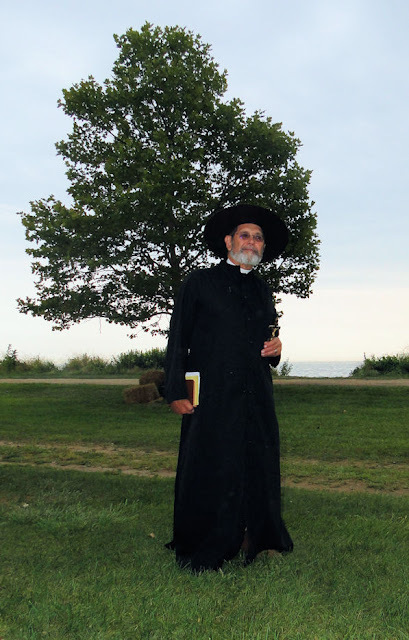 Whether or not you agree that we were a Christian nation, you cannot deny that this country has had a strong Christian heritage, and that's what this reenactment wanted to show. "As a congregation that not only loves the Lord, but rejoices in the freedoms upon which our nation was forged, we look forward to standing together in and through this unique event to celebrate these two extraordinary loves of God and country." 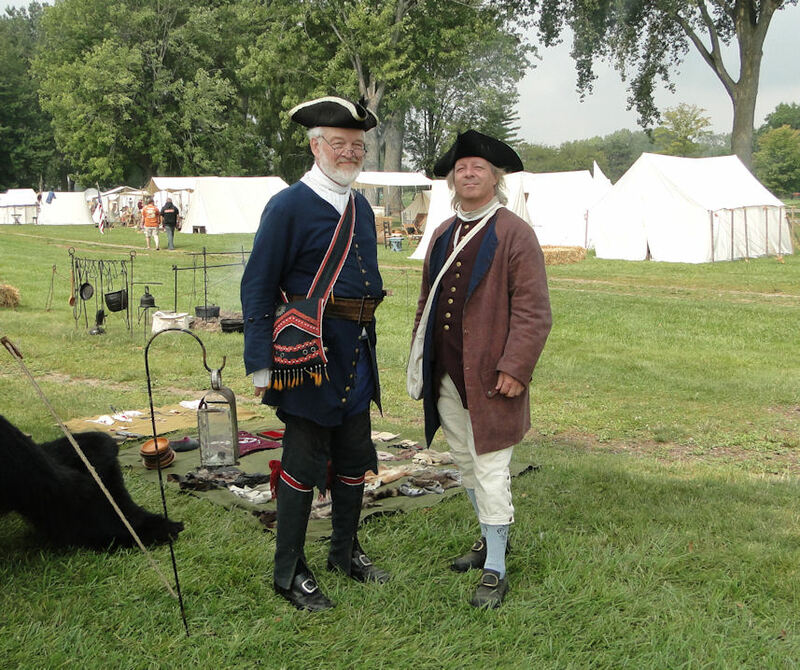 The audience was encouraged to dress in Colonial or Civil War clothing for the Event, which many did. From my friends that attended, they said it was an amazing - truly breathtaking - moment. Here we find our 3rd President, Thomas Jefferson, standing alongside the futuristic farmers of the 1860s. This event was actually a time-line of historical figures, and all who attended that I know said it was amazing. President Washington stands with two admirers at We Humble Ourselves. Yes, this is the same George Washington who presents at Mount Vernon. With a little photo-trickery, I was able to take away a modern background and replace it with a house that was standing in the 18th century. We Humble Ourselves really sounds like something I would have loved to have been a part of. If it returns next year, you can bet I will! Thank you for posting this. 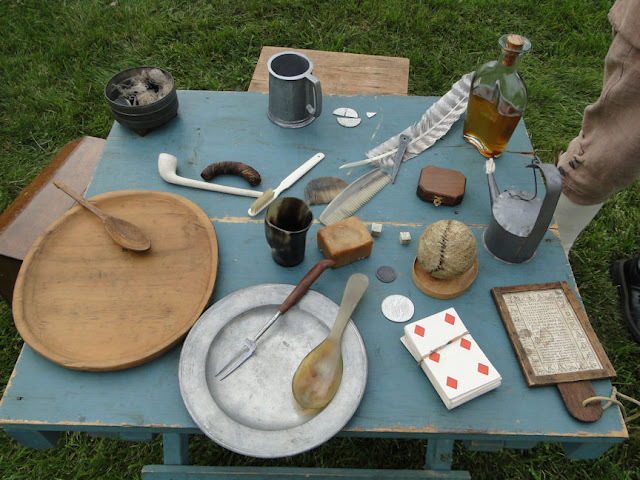 I would love to get into re-enacting although, sadly, my other half would have none of it. We live in northwestern Ohio, so not too far away, maybe I could go next year.